FLAGGING Chinese domestic demand for woollen garments has been partially blamed for Australian wool prices this week, which lifted for fine crossbred and Merino fleece, and for skirtings, but fell for medium Merino types. AWEX senior market analyst Lionel Plunkett said the strong positive movement experienced in the previous week’s sales could not be sustained this week. Despite rumours that the market had been affected by China filling its 2018 calendar-year quota for Australian wool, National Council of Wool Selling Brokers of Australia president John Colley said softer Chinese domestic garment demand was the main factor in the market’s position this week. “There is no doubt that in the previous four weeks, some of the (price) slide was caused by quotas being filled for delivery during the December period. “But this is not affecting the market as we speak today,” he said. “Anything which is bought and shipped now, doesn’t get there until January, which is within (January 2019) quota. The general feedback from China was that the softer demand was due to hesitance from mills and an inability to sell garments made with wool bought at previously higher prices. “It is softer demand from within China itself,” Mr Colley said. Although the number of bales offered in Australian auctions this week was 34,513 bales, 2624 more bales than last week. The national offering is now down by 18 percent when compared to the corresponding sale of the previous season, Mr Plunkett said. Brokers passed in 7.6pc of the offering. Mr Plunkett said the Merino fleece sector failed to attract the same amount of support that it enjoyed during last week’s sale. “The result was price reductions, with inferior style wool and wool with unfavourable additional measurement results the hardest hit in the falling market. “Fleece wool from 18.5 micron through to 21.5 micron generally lost between 15 and 30 cents for the week,” he said. “Although the Merino fleece sector generally recorded losses, the AWEX Eastern Market Indicator (EMI) managed a 2-cent increase for the week, to close at 1,860 cents. “However, this was mainly due to substantial rises in the crossbred sector,” Mr Plunkett said. The skirtings went against the trend of the fleece and added further gains to those achieved last week. Mr Plunkett said the crossbred sector recorded large rises this week, with strong demand helping to push prices for wool 28 micron and finer up by 80 to 90 cents. Mr Plunkett said the carding market continued its upward trend following on from the large gains experienced in the previous week’s sale. “Locks, stains and crutchings generally rose by 10 to 25 cents. 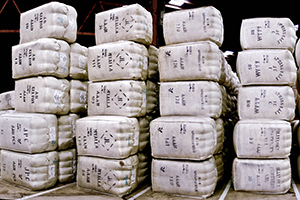 Australian Wool Innovation’s weekly market report said the absence of the largest Chinese indent trader operating normally this week caused some initial questioning from other buyers and then the subsequent price losses. But other buyers soon took advantage of the lack of that usually strongest of competition to obtain some volume of risk or forward coverage, AWI said. “The local traders stepped up their buying percentages, but key to note was the continued vigorous purchasing activity of one of China’s premier top makers. “During the downturn in prices, this top maker buyer has remained steadfast to picking up quantity, which now looks to be a wise move, as the quality of the selection diminishes and the volume of wool available from Australia retracts heading into the three-week Christmas recess,” AWI said. “Some talk abounded of quota issues now in play in China, with the global allocation totalling around 300 million greasy kgs of all wool allowed to be imported into China rumoured to have been fulfilled. “Australia has largely retained our share of that quota, with the official figures at the end of September revealing just a slight decrease of 1 percent of volume less having occurred year to year,” AWI said. “More importantly though, the value of that lesser supply from Australia has increased in value by 22pc year-on-year. Next week is the penultimate sale before the annual three-week Christmas. Quantities increase and currently, there is 39,510 bales rostered for sale in Sydney, Melbourne and Fremantle. “In fact, the final two sales remaining of the first half of the season will be around that figure, which is 5pc higher than last week’s forecast of what was originally offered to sell. “This is far short though of the 100,000 bales that was offered at the same time last year,” AWI said.